This is the month to write about the color red. Why? Because Valentine's Day is coming. Because red is the color of love. You disagree? That's ok. We don't look at color with the same eyes. But one thing we can agree. It's about food and plants we eat. Plants like apples, strawberries, cherries, tomatoes, peppers and pomegranates are often colored by forms of carotenoids, red pigments. One can usually identify a strawberry by its red flesh. Strawberries look like a fruity heart-shaped valentine! They are filled with unusual phytonutrients that makes them a heart-protective fruit. Red raspberry is most often the source of ellagic acid. This substance found naturally in raspberries belongs to the family of phytonutrients called tannins, and it is viewed as being responsible for a good portion of the antioxidant activity of berries. Cranberries are rich in antioxidants that are essential to optimizing health by helping to combat the free radicals that can damage cellular structures as well as DNA. Meat gets its color from the iron found in the myoglobin and hemoglobin in the muscles and residual blood. Red wine it's heart-healthy, it stands-up to full-flavored and full-bodied foods, it makes dining more interesting. Red wines can be plumy, or jammy, peppery or spicy. It is the grape skins that are responsible for the red wine's distinct color spectrum. The skins are in contact with the grape's juice during the fermentation process, allowing the dispersion of both color and tannins. Moderate amount of red wine lowers the risk of heart attack and can raise HDL cholesterol (the good cholesterol) and prevent LDL cholesterol (the bad cholesterol) from forming. Here's some ideas for Valentine's Day. Melamine plates to fill with tasty cookies, chocolates, fruits or whatever you like; colorful Expresso mugs also from Zazzle. 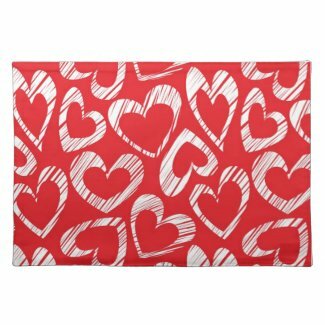 And some placemats you can use on your Valentine's dinner table or on your favorite tray. You don't have a tray? You can always improvise. Just get a Zazzle placemate on top of it and your ready to go. All these suggestions can be found at Zazzle's marketplace. Just click on each product and learn more about it. All Valentine's Day objects in this post were inspired by the color red. A couple of nice things we can display in our kitchens or dining rooms, why not? Let's celebrate love and passion just for one day or every day! Thank you for featuring some of my Valentine's Day products! We wish you a blessed 2014. Thank you for including my place mat in this awesome Valentine's Day collection.